As the latest retail industry figures show a sharp slowdown in non-food retail sales, we take a look at the problems one High Street in Rotherham is facing. There’s an early morning bustle at Fitzwilliam & Hughes, a Rotherham cafe over-looking the Minster and its gardens. It’s a corner plot in a listed building, it feels like a choice spot, but co-owner Matthew Leather is glum about the town. Rotherham Borough Council says it’s working on that. A masterplan includes a new area called Forge Island with bars, restaurants, apartments and a cinema down by the river and construction has started on a new university campus. Unemployment is higher than the national average at 5.6% and the town centre’s shop vacancy rate stands at about 23% – that’s nearly a quarter of the retail space. 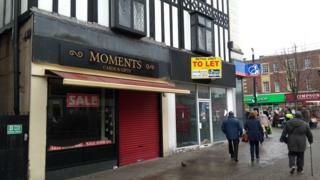 The main pedestrianised retail area has the usual mix of national names, banks, bookies, vaping shops and “To Let” signs. There’s even Jamie Oliver’s Ministry of Food unit, which launched as a healthy eating project on the back of a TV series, but it closed this year and stands empty, next to another vacant unit. The big retailers are conspicuous in their absence. Primark is leaving the High Street for the out-of-town Parkgate Shopping Park which is also home to M&S and Next. Chris Hamby, who sells shoes and antiques in the High Street and rents several other shops, is enthusiastic about Rotherham’s potential but he says the town needs those big retail names. “People like independent shops but you need a lot of crumbs to make a cake, you need a lot of people to come. Independent shopkeepers have long since complained that pressure from business rates has left them on the edge. A revaluation in April pushed up bills in some parts of the country, but in Rotherham rateable values fell by 2% on average. Andrew Roddison is one of those who’s benefitted. His Whistle Stop Sweet Shop and Temperance Bar in the Imperial Buildings now qualifies for full rates relief, and it’s made a big difference. Dannii (CORR) Paston, who runs clothing and gift shop Yella (CORR) Brick Road on the High Street, doesn’t pay rates and is happy with her rent, but she thinks “ridiculous” rent demands from some landlords are the fundamental reason behind empty units. “It’s as if they’re out of touch with what people are taking through the tills. In general the council-owned buildings are full and the ones that are empty are private landlords. She’s also noticed the impact of the Brexit vote. “It was strange, like a switch. When Brexit was voted in, it just went down, I can’t really explain why that might be. It’s Friday lunchtime and the Holy Ghost Tattoo Collective is busy with people getting tattoos and piercings. “We’re doing really well, I think we’re probably one of the few that are thriving in Rotherham,” says owner Emily Dawson. Many of the problems Rotherham’s shops are facing are mirrored in towns across the UK and the solutions are not immediately obvious. As the council’s regeneration director Damien Wilson says “change will not happen overnight”.